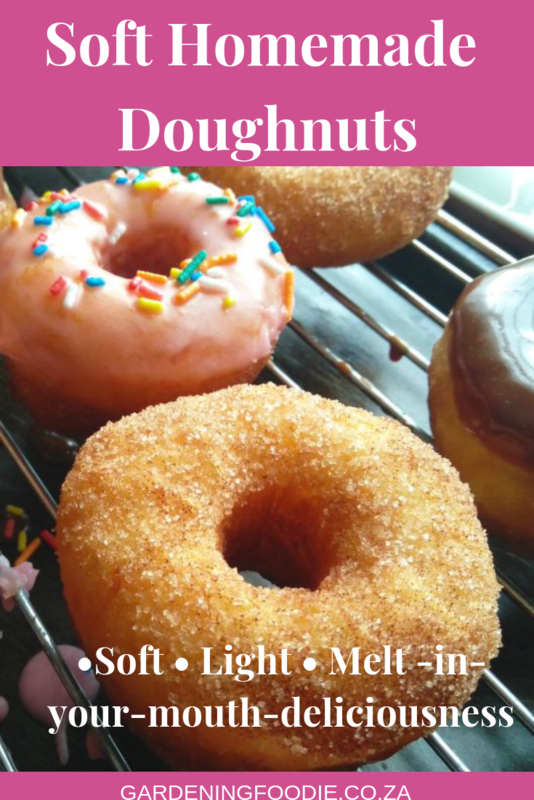 These melt in your mouth soft homemade doughnuts are so delicious, perfect and airy. Top with melted chocolate, glaze or just cinnamon sugar, and watch these little rings of delight disappear off the plate in record time. There is no beating any classic recipe, they are pure nostalgic comfort food, shared and passed on through the years. Made with minimal change today in our kitchens, coffee shops, restaurants or bakeries. 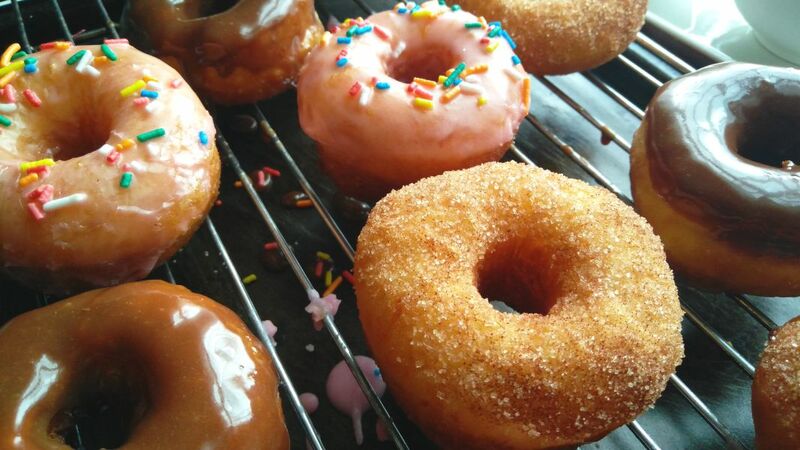 Just like with these super soft classic doughnuts, absolute perfection and even better homemade. Easy to prepare, and dipped in your favourite toppings, makes this a really fun recipe. In this recipe, I used vegetable shortening. This is what gives the doughnuts that crisp, melt in your mouth texture. If you do not have shortening, then go ahead and substitute it with butter. 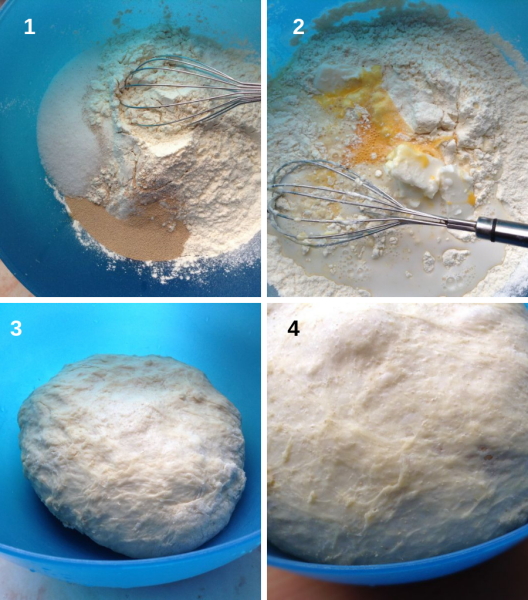 Do not over handle the dough, just mix and knead it for 3 to 5 minutes until it forms a soft dough. After the dough has risen, press it out using the palms of your hands before cutting into doughnuts. Avoid using a rolling pin. Overhandling the dough will cause the doughnuts to lose that soft and airy texture when fried. Allow the oil to heat up to between 350°F – 370°F ( 176°C – 185°C ) before frying the doughnuts. In a jug or saucepan, warm the milk and water. It should be just warm, not too hot or cold. If you have a thermometer, it should read between 100° – 115°F ( 37°C – 46°C). Add beaten eggs, shortening or butter to the warm milk and water mixture ( wet ingredients) and mix. Add the wet ingredients into the bowl with the dry ingredients and mix to combine. Turn out onto a floured surface, and knead for about 3 to 5 minutes until the dough is soft and smooth. If you find that the dough is too sticky, then add up to ¼ cup extra flour while kneading. Place the dough back into the bowl and in a warm, draft free area of your kitchen, allow the dough to double in volume. This should take an hour. After an hour, punch down the dough and turn it out onto a floured surface. Using your palms press out the dough to about ½ inch ( 1 ½ cm ) thick and cut out the doughnuts using a doughnut or cookie cutter. If you are using a cookie cutter, then cut out the centre of each doughnut using a smaller cutter as well. Place the cutout doughnuts onto a tray and leave to rise again for about 15 to 20 minutes. Using a deep pan, add sufficient oil to deep fry the doughnuts. Deep fry the doughnuts for about 1 minute on each side, until cooked and golden brown. 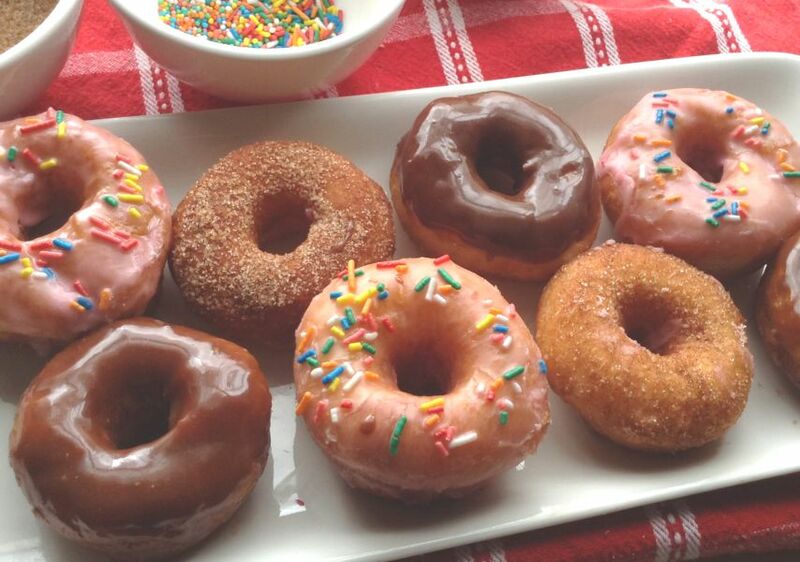 Drain the doughnuts on paper towel and top as preferred. 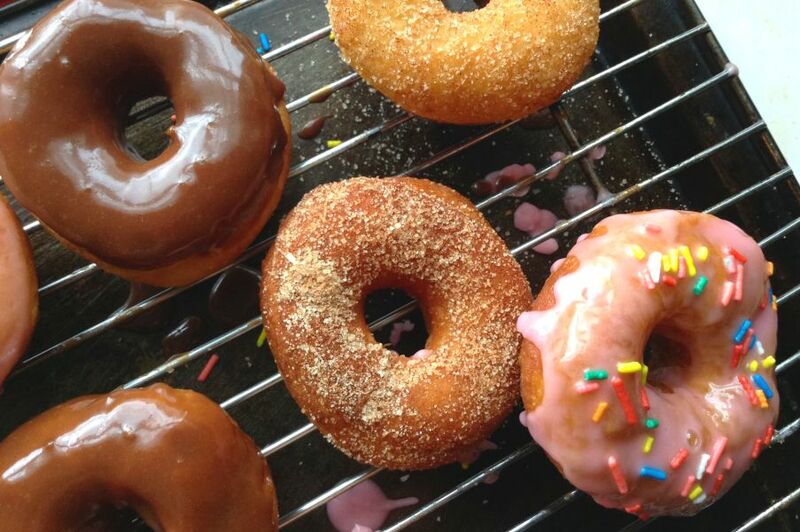 Topping suggestions: cinnamon sugar, melted chocolate, or a simple glaze. 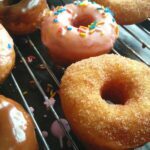 Super easy to make, skip the store bought the next time and give these homemade doughnuts a try, so deliciously soft and light. Add beaten eggs, shortening or butter to the warm milk and water mixture ( wet ingredients). After an hour, punch down the dough and turn it out onto a floured surface. Using your palms press out the dough to about ½ inch ( 1 ½ cm ) thick and cut out the doughnuts using a doughnut or cookie cutter. 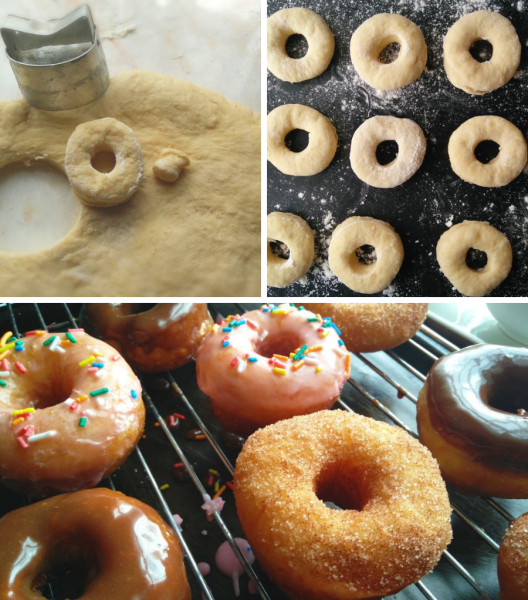 If you are using a cookie cutter, then cut out the center of each doughnut using a smaller cutter as well. Place the cut out doughnuts onto a tray and leave to rise again for about 15 to 20 minutes. 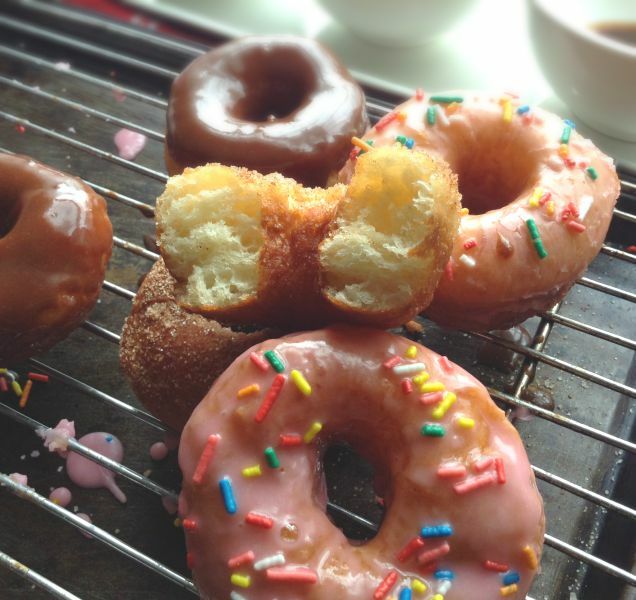 Using a deep pan or pot , add sufficient oil to deep fry the doughnuts. Allow the oil to heat up to between 350°F - 370°F ( 176°C - 185°C ) before you start to fry the doughnuts. Topping suggestions : cinnamon sugar, melted chocolate, glace icing. These look awesome Ashika! They caught my eye on Facebook and I just had to pop over to check out the recipe! Thanks for sharing! Comforting it is 🙂 Love it ! Thank you Ashika ! 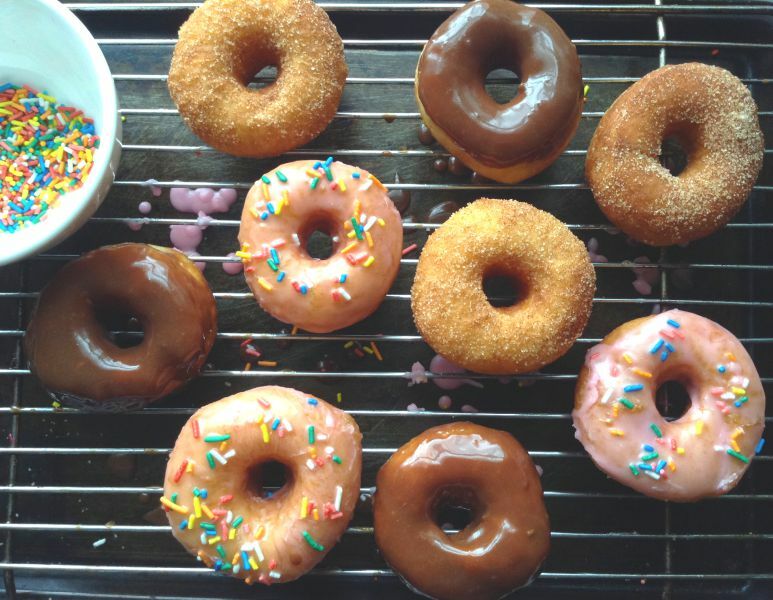 These doughnuts do look amazing, I have never tried making fried ones before but I must admit nothing beats a fried doughnut. Ashika, these look killer! I’ve never fried my own doughnuts but I think I need to start. I’m just afraid I won’t be able to stop! There’s nothing like a classic donut, Ashika! And these are beatiful and look so scrumptious I’d like to try them all, please! Those are some fine looking doughnuts. They could set on the racks at any Dunkin Donut House. We don’t have proper donut shops here so I might just make up a batch for the holidays. Hello! Although I realize this is not a Hanukkah post, it is customary to eat fried foods to celebrate the holiday so this is a very timely post for me! These look amazing! These look absolutely fabulous!!! Looks so soft and so perfect. I haven’t made doughnuts in a long time. This is such a yummy treat!